One of our best qualities is our versatility in the type of shows we can put on. The foundation of our skill set comes from traditional Kung Fu training and is on full display with our footwork and powerful head shakes. Our performers can mimic the movements of the lion (cat) and its various types of facial antics; fast footwork; and power. Stunts: our performers are trained for incredible stunts that keep our audience on edge. Our lions have been seen doing swoops, 360 degree kicks, full stack on shoulders, baby stacks, hopping on benches, and more. We credit the Kung Fu and weight training program our team goes through to make these stunts look easy. Musical variety: as part of our storytelling, our drumming and music also changes with the scene. This prevents monotony in the drumming and keeps the story moving forward like a music score in a movie. We change back and forth between eight different types of beats on any given show. We owe a huge debt of gratitude to our first Lion Dance teachers, Master Gordon Erquiza and his students Sifus Brandon and Jamie Tom. Together they form Saam Fu, our sister school out in paradise Honolulu and Los Angeles. 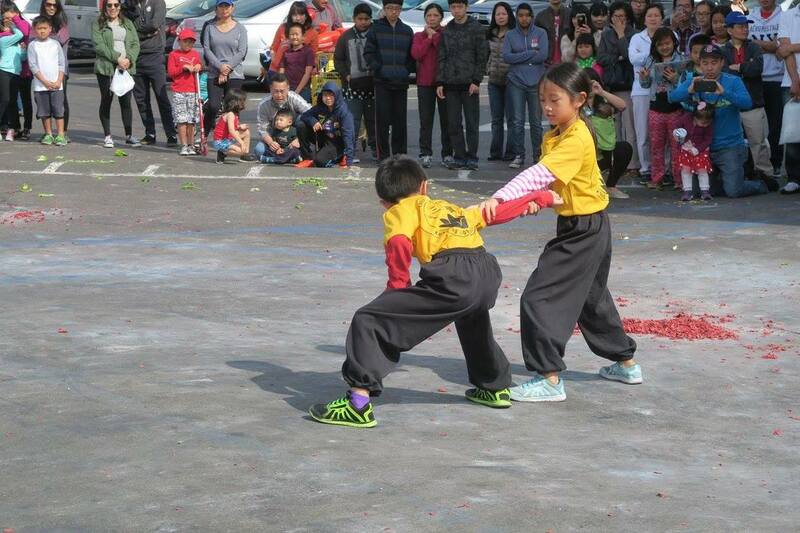 We are also grateful to our current teachers, Master Jeff Chan and his son Vincent of the Immortals Lion Dance Troupe based out of Monterey Park, CA (Los Angeles). We also want to thank our Kung Fu brother, Yogi Tam, who joined the Immortals in 2008 but began his Lion Dance career back in the mid-80's in New York City Chinatown and continued through his training under Grandmaster Hoy Lee of the Jow Ga system. You can see the brilliance of our teachers in our shows and we will always be indebted to them. We are always looking for additional help and fun people to join our team. Current openings are for help with musical instruments (cymbals and gong.) These are the positions you begin with and we will promote you to new areas as soon as you are ready. If you wish to Lion Dance, however, you are required to learn the Kung Fu. Without Kung Fu training, it is impossible to do perform proper Lion Dancing. If you want to help but do not have the time to put in for training, you can be a stage hand or help with the marketing. Our only restriction is you cannot currently be on another team or attend another Kung Fu school. We also cannot accept you if you recently quit your team to try to join ours. Martial arts politics is very real and we are careful not to gain a reputation for stealing students.